Understanding the Lord's love, presence, and nearness should lead us to serve him and to deepen our relationship with him. While we love God for many reasons, we want to express our love to him today especially for his personal concern for us. 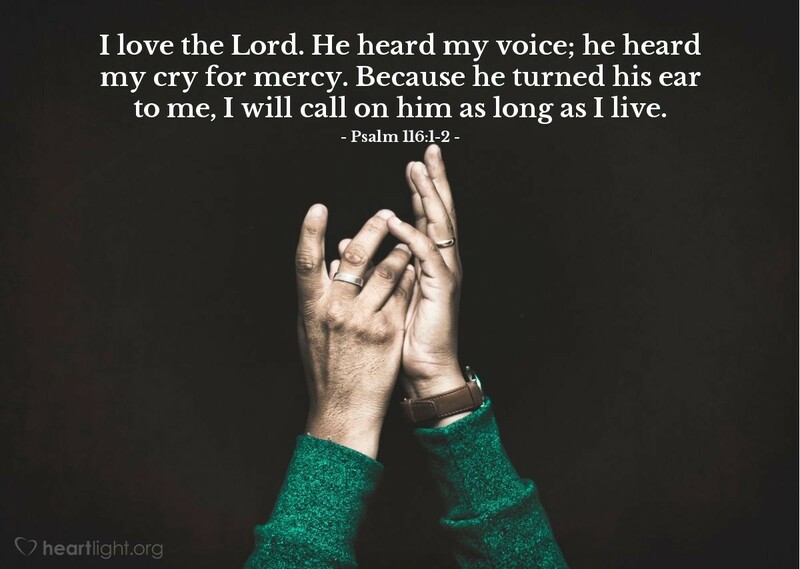 In a world where important people refuse to spend time with those "beneath" them, we are truly blessed with an incomparable God who listens to our every cry, recognizes our very own distinct voice, and tunes his ear to hear every one of our whispers. Yes! I will call on him, praise him, thank him, confess to him, and speak with him as long as I live! Father, you know each hair on my head and every thought on my heart. Thank you for hearing my prayers. Thank you for answering so many of them with the answer I sought from you. Give me patience when I cannot see your hand in the other answers that do not come as soon or do not bear the result that I request. I believe and trust that you are there and working for my good even when I can't see it. I believe you always answer to your glory and my best interest. But please, dear Father, strengthen my faith so that I will never outlive my trust and faith in you. In the name of Jesus I ask it. Amen.